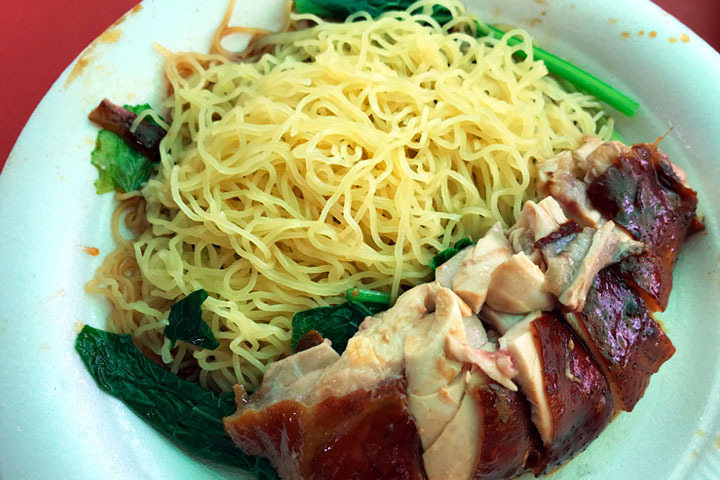 I have never devoured chicken so tender and soft before discovering Hawker Chan’s humble soya sauce chicken rice and noodle stall in Chinatown. As a general rule, the hawker stall with the longest queue typically has the best food and this principle has served me well living in Singapore. That was how I discovered Hawker Chan. As is my usual Saturday morning tradition, I was browsing the Chinatown Food Complex looking for some lunchtime inspiration. I still hadn’t had my morning coffee and I carried a slight headache after a few too many wines the night before. I was also very, very hungry. The plump, golden-skinned chickens hanging in the window at Hawker Chan’s immediately caught my eye. Next was the abominably long queue. But despite my ravenous appetite, I was prepared to wait as I knew the food would be good. As I diligently queued, I realised that this was the famous chicken hawker stall everyone talked about. The one known for selling the cheapest Michelin starred food in the world! 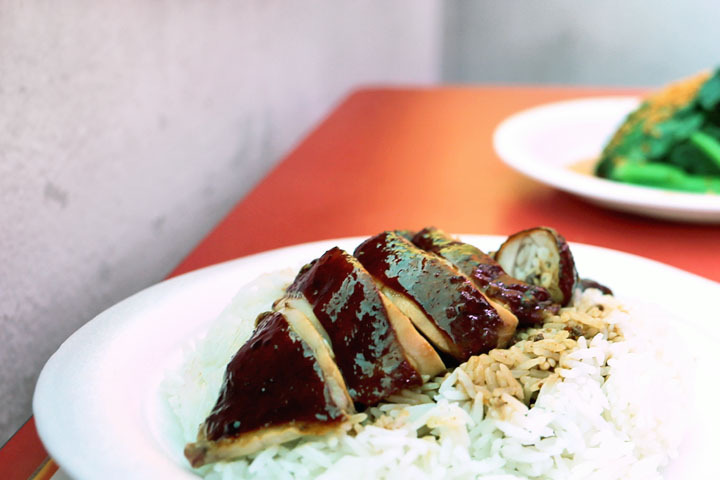 Their signature soy sauce chicken rice is $2 or you can order an entire chicken for just $14. The menu is simple. 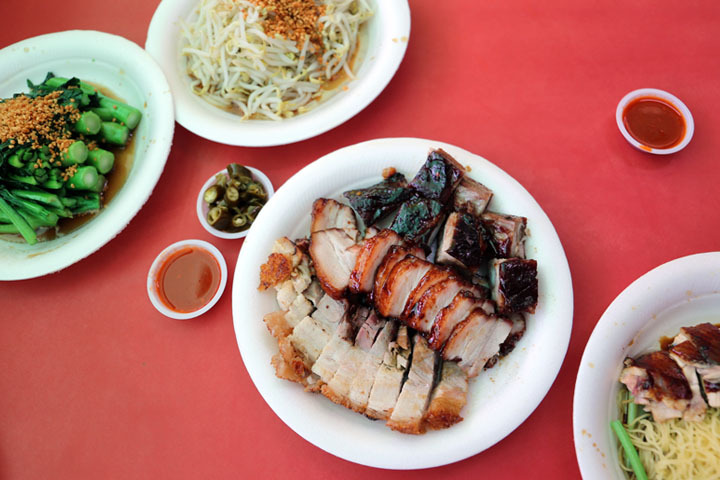 In addition to soya sauce chicken, Hawker Chan also specialises in roasted and barbecued pork. Meats are served with rice or yellow egg noodle. There are also seasonal vegetables and soya beansprouts available. As I was feeling both hungry and greedy, I decided to order a bit of everything, which only set me back $20. The chicken was the highlight of the meal. The flesh was extremely succulent and encased in a crispy, dark brown skin that was roasted to perfection. I ordered it with the thin, egg noodle that was half drenched in soya sauce and I added extra chilli sauce for taste. My friend ordered the chicken with rice, which was plain steamed rather than cooked in fat, as is the case with the Hainanese chicken rice stalls. There was plenty of chicken meat on the bone and portion size was generous. The pork belly was faultless. It had just the right amount of intoxicating gummy, white fat holding the generous, tender pork meat and crunchy pork crackling together. I savoured each bite slowly, knowing the gruelling workout that would be required later at the gym in order to redeem myself. The other pork dishes were also very good although not as mind-blowing as the chicken and pork belly. 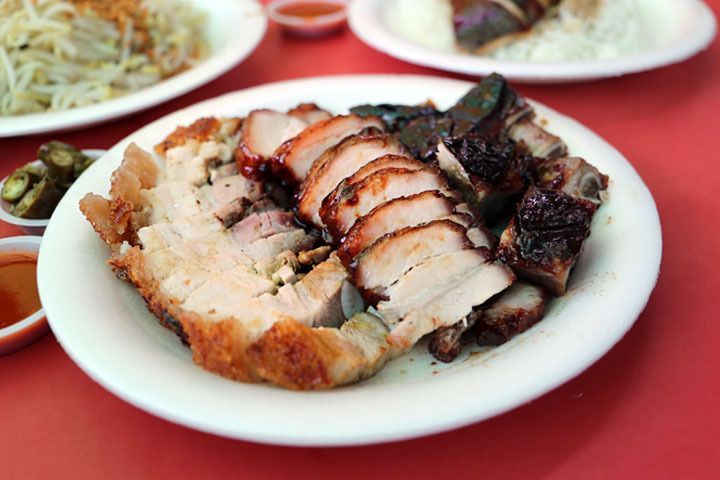 The char siew slices were cut thick and barbecued to an aromatic and reddish hue in the Hong Kong-style. The pork rib was thickly coated with black, sticky sauce and had a meaty yet sweet palate. The plate of seasonal greens for $3 was massive, lightly steamed with plenty of roasted garlic thrown on top. The side of bean sprouts added necessary texture and crunch to our otherwise protein and carb-heavy meal. I am impressed that Hawker Chan has not increased the prices of his food since winning a Michelin star in 2016. Not only is everything delicious, it is great value for money. 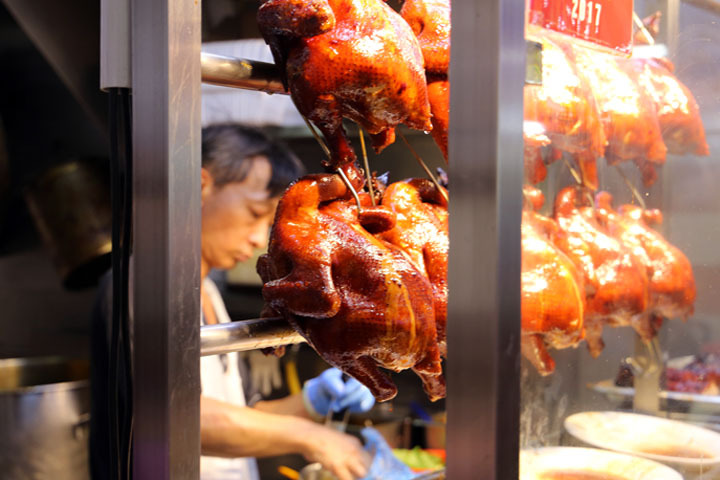 The owner, Chan Hon Meng continues to manage the successful Chinatown hawker stall together with his wife, despite having expanded his enterprise to include additional restaurants in Chinatown and Toa Payoh. After my incredible first experience at his original stall, I am excited to try out his other restaurants as I continue to eat my way through Singapore.